There are many features to utilize on your Amazon Author Page that can attract customers and ultimately increase sales. Items such as: product details and more about the author sections allow you to provide in-depth information about you and your book. Let’s take a look at the customer review section for Broccoli Chronicles. This sections allows you to see how many people have created reviews for your book. 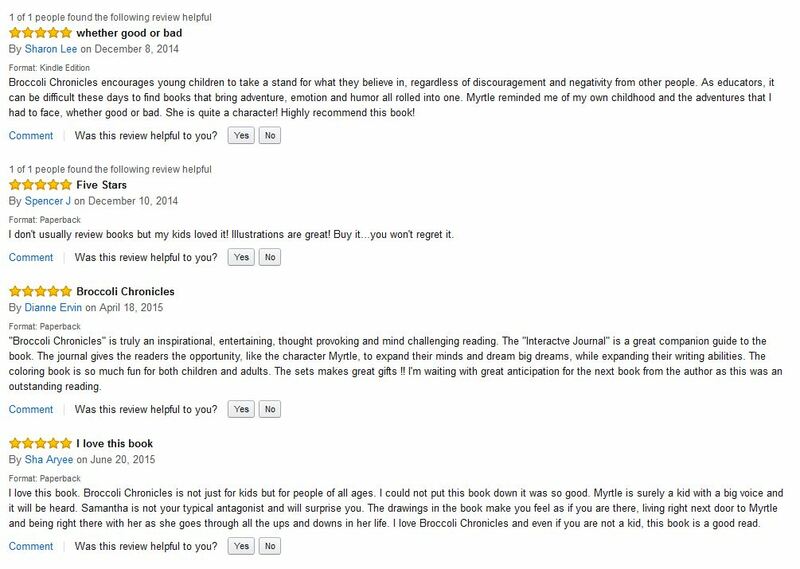 As of June 23, 2015, Broccoli Chronicles has a total of 14 reviews, in which all 14 customers gave the book a 5 star review! It took about 7 months for me to obtain the 14 reviews and it is projected that the reviews will double by the end of the year. See below some of the comments made by a few of my customers. Self-publishers don’t have the marketing campaigns and bookstore displays that traditional publishers can supply for their authors. Therefore, authors need to utilize every aspect of advertising that is available to them, especially by gaining positive reviews for their book. Reviews should be a top priority in the self-publishing field although they don’t directly increase sales. Reviews actually help sway indecisive customers into buying your book which indirectly increases your sales. Since you don’t have the popularity behind your book, having a ton of positive reviews from teachers, parents, librarians, and community members will inform and persuade customers to give your book a chance. Start getting more reviews asap! !